Stamps.com makes mailing a letter easier than ever. With Stamps.com, you have all the functions of the Post Office™ right on your desktop—including purchasing postage. We make it easy to send a letter by printing USPS postage, a delivery address and a return address directly to your envelope. Stamps.com even checks your delivery address against the master USPS database, eliminating the hassle of letters being sent to an incorrect or undeliverable address. And when you print First Class Mail postage for a letter using Stamps.com, you automatically qualify for a postage discount that is not available at the Post Office. The USPS provides access to the “Metered Mail Rate” for all online postage vendors. The Metered Mail Rate is currently five cents cheaper than the First Class Mail rate at the Post Office (currently $0.55). The process described below is for printing postage directly on an envelope. Stamps.com can also print postage directly on adhesive labels (NetStamps) with the labels being used exactly like regular postage stamps. 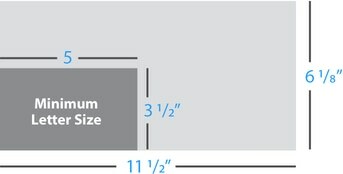 Measure the dimensions of your envelope. Remember, even if your mailpiece is in a standard-sized envelope, it may not be classified as a letter. Bulky, square or irregular-sized envelopes are not machinable—meaning they cannot be run through USPS’s automatic sorting machines. In these cases, you’ll have to pay a surcharge for the USPS to process your irregular mailpiece. 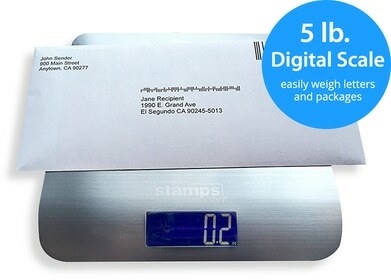 Place your envelope on the Stamps.com scale to ensure you have the correct weight before proceeding to the next steps. Letters heavier than 3.5 ounces should be mailed in Priority Mail Flat Rate envelopes, which can accommodate up to 70 pounds. Verify Return and Delivery Addresses. In Stamps.com, click ”Envelopes“ in the navigation bar. Here, you’ll check that your Return Address and Delivery Address are is correct to print. Stamps.com automatically runs all addresses through the USPS database to ensure correct street names, directional information and ZIP codes are accurate for sorting and delivery. Remember, you can add a company logo to your Return Address when printing directly on an envelope! Stamps.com automatically sets the letter weight to 1 ounce, so if your piece weighs more than 1 ounce, input the actual weight here. Select your “Mail Class” and add any Special Services needed. Once you’ve input addresses and weight, you’ll be able to select a “Mail Class.” Most letters mailed in the U.S. use First Class Mail for delivery. You will also have the option of adding insurance and choosing a mailing date for the future (default mailing date will be today’s date). In addition, the “Cost Code” feature appears if you choose to keep track of your postage expenses on in Stamps.com. The “Printing On” dropdown will offer a variety of envelope sizes. Remember, a standard business envelope is #10 (4 &frac18; × 9 ½ inches). Preview and print your envelope. View your envelope in the “Preview” window before printing. We suggest using the “Print Sample” feature if this is the first time you’ve printed envelopes in your printer to ensure the print alignment matches. If the preview looks good, load your envelope into your printer and click “Print Postage.” (If there’s a problem with printing, it’s fast and easy to reprint at no extra charge!) Once your envelope has been printed, the postage value will be deducted from your Stamps.com account balance. Once printed, you can now either drop your letter with postage in a USPS collection box (blue box on street corners) in your local neighborhood or hand the letter to your USPS mail carrier as they deliver your daily mail. You can also drop it off at any Post Office.